The Chrysler 200 is all-new for 2015. Introduced in 2011, the Chrysler 200 took up where the Chrysler Sebring left off. That is, it occupied a position toward the bottom end of the midsize sedan pack. Not so much in sales, rather in looks, engineering, and the execution of the final product. The 200, like the previous Sebring, is a model that screamed dated especially when lined up against its chief competitors including the Nissan Altima and Ford Fusion. Other models competing in this segment include the Toyota Camry, Honda Accord, Chevrolet Malibu, Hyundai Sonata, Kia Optima, Volkswagen Passat, Subaru Legacy, Mazda 6 and the related Dodge Avenger. Some models are better than others, but except for the Avenger all are more modern and better refined. The Dodge Avenger, by the way, will continue with its same design for 2015. The 2015 Chrysler 200 is now available, priced from $21,700 (LX) and available in four trim levels. Beyond the base LX you can choose from Limited ($23,255), 200S ($24,495) or 200C ($25,995) models. The sedan is based on the same platform underpinning the compact Dodge Dart, itself based on Fiats compact wide architecture that spawned the Alfa Rome Giulietta and the Jeep Cherokee. The 200 is not the Darts twin as this vehicle comes in longer, wider, and heavier than the Dodge. For 2015, Chrysler also drops the convertible model. Chrysler hasn’t announced its sales goals with the new 200, the beneficiary of a $1 billion investment in its Sterling Heights, Mich., manufacturing facility which also led to hiring 800 more workers. Sales up to now have been heavily reliant upon fleet customers including daily rental companies. Those sales come with lower profit margins and also have a debilitating effect on resale value. Should Chrysler show much discipline here, it could make more money even with the same amount of sales. 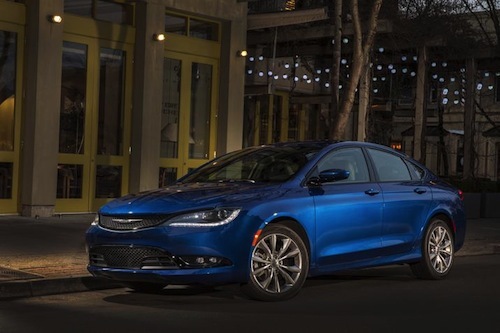 There are two features that may distinguish the 2015 Chrysler 200 from the pack: a standard 9-speed automatic transmission and available all-wheel drive. The 9-speed is unique to Chrysler and is found in a segment where 6-speed automatic transmissions are the standard with the occasional continuously variable transmission included. Few competitors offer all-wheel drive standard in the Subaru Legacy, optional in the Ford Fusion another area where Chrysler hopes to find an advantage. It is a risky and expensive move to offer all-wheel drive, what represents a $4,200 upgrade on the 200S and 200C, the only editions offering it. That puts the 2015 Chrysler 200 closer in price to the Ford Fusion and above the Subaru. (See our review, Subaru Legacy Delivers Quality and Reliability). Under the hood, Chrysler offers a 2.4-liter four cylinder engine making 184 horsepower and a 3.6-liter V-6 making a segment-leading 295 horsepower. In the 2014 Chrysler 200 convertible that larger engine was also offered and torque steer was quite apparent when we tested it (See our review, Chrysler 200 Convertible Provides Much Drama). For 2015, Chrysler says that the new model delivers sporty European handling dynamics and steering precision. In its press release announcing the 200, Chrysler mentioned modulating steering as one attribute, perhaps hinting at torque vector control, what sends braking power to the inside turning wheels to eliminate understeer in front-wheel drive models. Other improvements that Chrysler hopes will attract shoppers include available LED daytime running lamps, LED fog lamps, and LED tail lamps. An improved fascia, available 19-inch wheels, upgraded interior colors and trim, an available 7-inch LED instrument panel, its latest navigation packages, and a host of safety features including available adaptive cruise control, forward collision alert and park assist, can be had. Auto Trends will have a full review of the 2015 Chrysler 200 following our press fleet rotation later this year. 2015 Chrysler 200 photo courtesy of Fiat Chrysler Automobiles Ltd.